The VERA Communicator is designed to securely exchange data with your existing Energy Trading and Risk Management systems (ETRM), corporate systems and external systems. VERA automates the consolidation, formatting and record creation in a central process with little to no manual intervention. By automating these processes and fully integrating them with other existing business processes within your energy trading, scheduling and back-office environments, you are better prepared to take advantage of market trends and opportunities. The use of the VERA Communicator in concert with the other VERA applications significantly reduces the time and errors associated with extracting data that is scattered throughout your enterprise and beyond. For example, the consolidation, formatting and creation of transaction records for FERC Reporting is, for many organizations, a very manual process involving many steps, users, systems and spreadsheets. 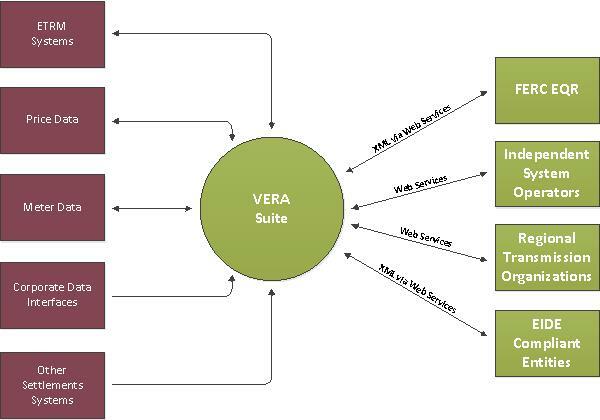 VERA extracts information from your existing ETRM systems and corporate databases and electronically delivers reports which are compliant with the current FERC EQR filing requirements. VERA reduces the time of manually acquiring the data, and eliminates potentially costly errors in meeting FERC compliance requirements.